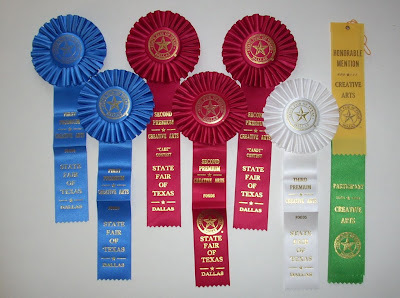 I won seven ribbons at the State Fair of Texas!! For several years, I've had every intention of entering, only to procrastinate my goals into oblivion. This year, I decided nothing would stop me. Place lime juice in a one quart bowl. Peel bananas and slice directly into lime juice. Split open vanilla bean. Scrape seeds from vanilla bean and add to banana mixture. Place sugars, water and remaining vanilla bean pod into 3 quart pot. Stir to dissolve sugars. Bring syrup to boil and boil five minutes. Add bananas and cook until thick, about 20 minutes. Remove vanilla bean. 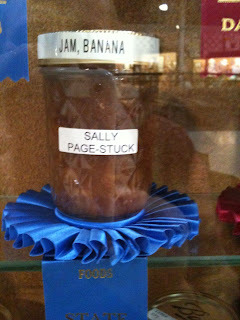 Spoon into sterilized ½ pint jars. Process in hot water bath for 10 minutes.